Does your workplace celebrate winter? Avoid the lethargy of the winter blues with a celebration to motivate staff, mark the end of the financial year and appreciate your employees’ hard work and dedication. Plan a mid-winter boost to staff morale with a Yulefest or Mid-Winter Yule and make July a reminder to plan for end of year business targets and order your prepaid cards as holiday bonus gifts for staff! The short days and long nights of mid-winter can have an adverse impact on staff and recognising this is an opportunity for a company get-together to have some fun. Celebrate the end of one financial year and the beginning of another, and remember, it is also the time for planning your end of year incentives. Australian workplaces are culturally diverse so choose your mid-winter event to be inclusive of all staff by celebrating the coldest month of the year. Research demonstrates that organisations that manage cultural diversity well are likely to have an advantage, with outcomes including greater employee commitment and team performance, larger market share and improved customer and client satisfaction. Themes for mid-winter events should cater for all staff so they are accepted as a unifying activity. Brainstorm a theme with staff, or think about Winter Wonderland, Yulefest, Mid-Winter Yule, Winter Masquerade, Sunday Funday. Decorate in theme or if there is no theme, keep décor non-specific, with universally enjoyed decorations such as balloons, candles and flowers. (No Santas or Christmas trees). Get staff involved in the planning so they feel part of the celebration. Inclusion is encouraging and a positive experience for staff. Consider a family-themed event like a mid-winter picnic or visit to a theme park that involves staff and extended families to appeal to everyone on the staff. Everyone is different and everyone likes to choose their own gift. When you are thinking about recognising staff for their work, the ideal bonus is a prepaid card. It has the inbuilt advantage of being able to use the card at retailers all over the world so it is easy for the recipient to choose their own perfect gift. A study by the Network Branded Prepaid Card Association reports that for recipients, a key feature of a prepaid card is being given the ability to choose a perfect gift for themselves. Corporations are recognising the intrinsic value of using prepaid cards as staff incentives, employee recognition and even for petty cash. Companies that use cards as employee incentives are finding that staff welcome having their own card and tend to purchase ‘luxuries’ that they would not otherwise consider as they value the gift-buying experience. A personalised prepaid card may be used numerous times until the balance is used up and each time it is used, your employees will be reminded it is a gift from your company. 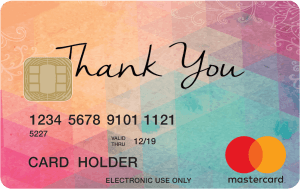 Staff feel valued as individuals when they are rewarded with a prepaid card from their employer. For your custom cards to be delivered in time for your corporate functions at end of year, place your order now. Corporate Prepaid Cards offer a variety of generic Mastercard, Visa and eftpos cards with a range of designs to suit all businesses. You have the opportunity to personalise your cards with your company’s logo and with Corporate Prepaid Cards you can fully customise the design artwork. View the range of cards on the website corporateprepaidgiftcards.com.au/card-designs/. Once your design is finalised Corporate Prepaid Cards offer the convenience of batching small runs of custom cards. You can order up to 200 cards to be delivered within 10 business days. Cards are ready for gifting in convenient card wallets that include details on how to activate the card, check the balance and view transactions online.